It is a rare blessing to have a dish you can prepare in only 20 minutes that makes a lasting gastronomic impression on your guests. This one is so easy to cook I sometimes feel I am cheating my guests out of the time and care they usually see in my cooking. But there is a case to be made for simple Italian dishes, and this one definitely has a lot going for it. 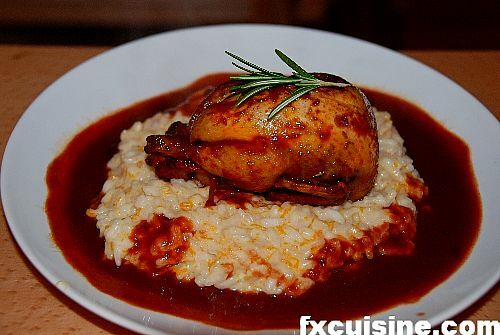 The other day I made it for my dad and served the quails over a delicious quash risotto. 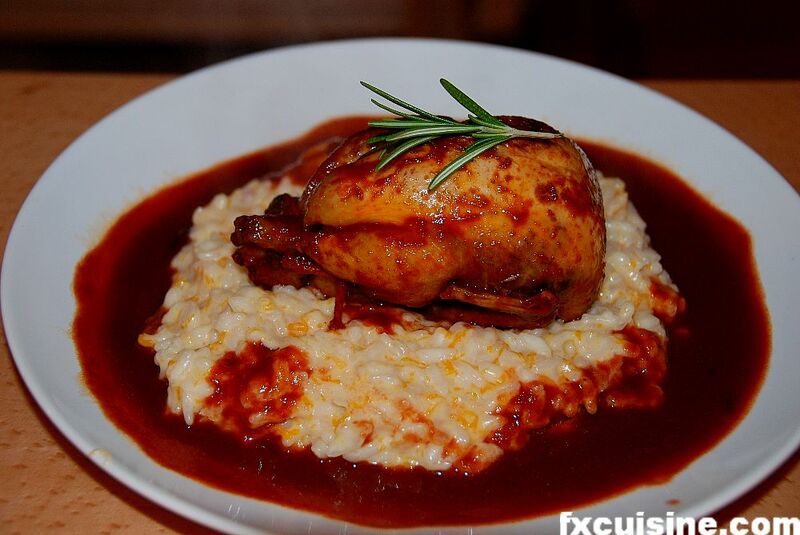 I could not believe my ears when my dad asked to eat the risotto first and then the quails. He was right, the risotto's flavor and delicate balance was overwhelmed by the intensity of the garlic-rosemary quail tomato sauce. From now on I'll serve it, like you see here, over a bed of polenta. The ladies at the River Café are adamant that Cabernet Sauvignon is the best wine for this dish but I tried several reds and got good results so don't give up on this dish just because you don't have Cabernet Sauvignon. Much more important is the quality of the rosemary. 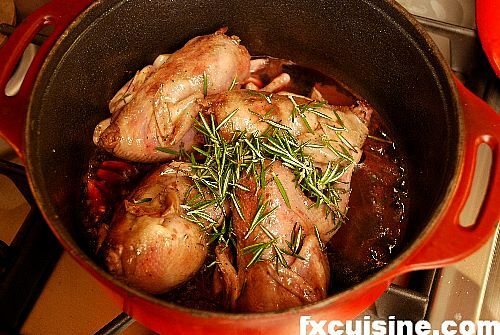 If it doesn't smell like heaven from a distance, go find another bunch of rosemary or cook this some other time. The rosemary's intense fragrance will dominate the dish and once you have tasted it with an exceptional rosemary, you can't go back. Dry rosemary is possible too if it smells nice. But how do you tell good rosemary from bad one? Well, if you have to ask, then you don't have the right rosemary. As for the chili, I use a dried Mexican serrano chili for this dish but you could use any dried red chili and still obtain an exceptional dish. 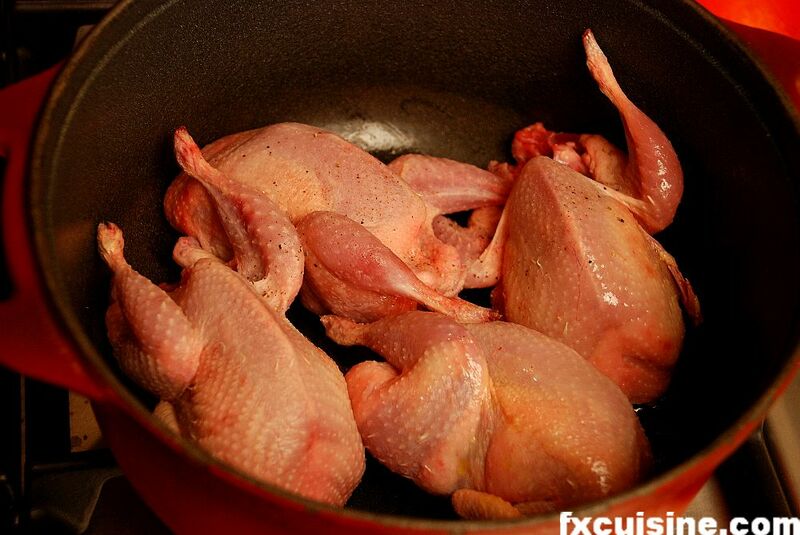 In a heavy-bottomed pot sauté the washed quails and garlic cloves cut in half lenghtwise in a bit of olive oil. Salt and pepper. On the picture I used Cailles des Dombes - French quails who cost about $5 each. 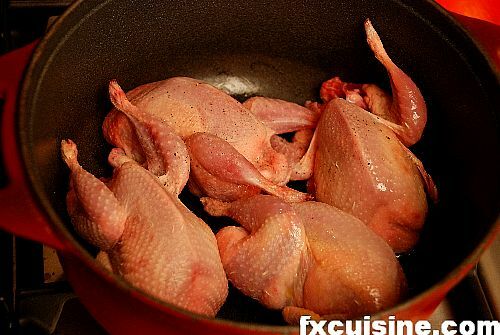 Cover and cook over medium heat for about 12 minutes or until the quails are cooked. I usually leave them slightly pinkish in the core. Add remaining wine and cook a further 2 minutes uncovered. Serve one quail per guest as a first course or light second course, or two quails as a hearty only course. I sometimes cook this on week nights, very conforting food indeed. You will do this dish again and again. 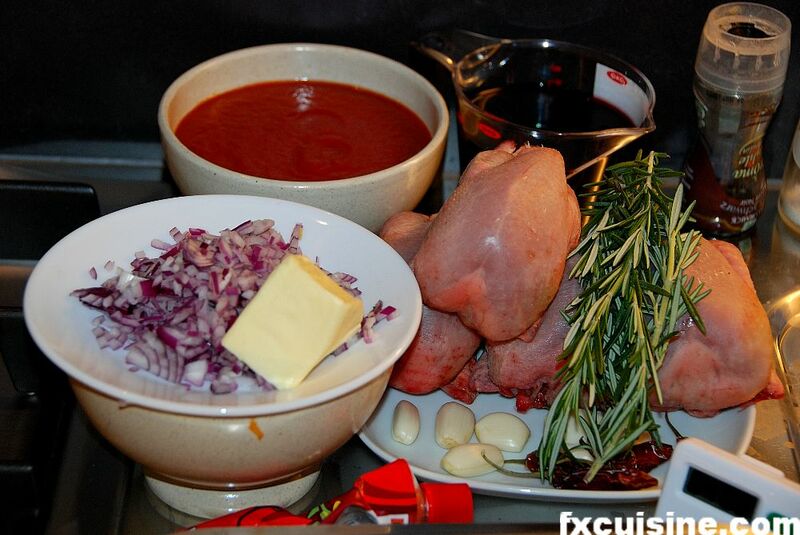 Make sure you don't put too much wine otherwise the sauce will be runny. You want a thick sauce that will stick to the meat. 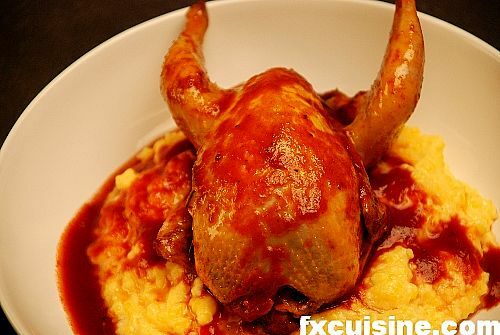 I re-did this dish with risotto for guests who didn't care for polenta. Slightly improved presentation but still miles to go. Try this at home and send me a picture! 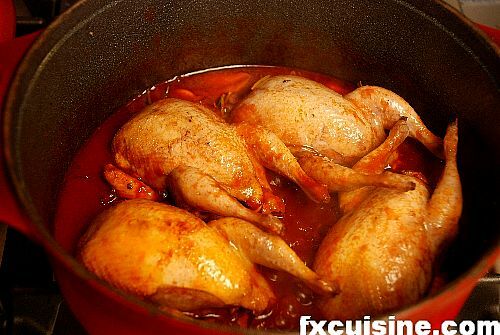 Do you think I can replace quail for chicken? Or maybe another white meat? I live in Canada and I cannot find this bird in my grocery shops or butcher, but I liked your recipe and would like to try it. Thanks. Anna, you go right ahead with a very young chicken or another small bird that can cook in 20-30 minutes. Quails are fancy but you might find them sold by the half-dozen in Mexican food markets if there is such a thing in Canada (my recollection is you are long on Chinese but short on Latinos!). If you can access some game birds of light taste it might work too. Let me know how you fare and thanks for visiting! The recipe sounds fantastic and I plan to try it. But I would like to know what you do with the chili? I can tell from the picture that you are using a whole dried chili pepper. Do you grind the dried chili or use it whole or break it into pieces or what? Also -- When is the chili pepper added to the recipe? Thanks! I just have found you recipe, it looks and sounds delicious to me.We are going to "have it"
I shaLL tell you about the result later. I tried recipe this last week. The quail itself turned out very well but I was less impressed with the sauce. Next time I think I will sustitute the tomatoe puree for chicken stock / chopped tomatoes. 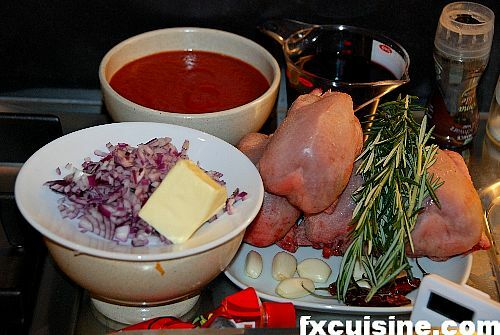 I also think some Madeira wine would go well in the sauce. For the base I wanted something very simple so I used a combination of Greek rice (actually orzo pasta) and red Italian beans (similar to pinto beans) all cooked in chicken stock. it turned out well. FX's answer→ Good luck for next time! I tried this recipe again and the sauce was much better this time. I didn't really use tomato paste (I instead used crushed tomatoes strained of their water) the first time and so that it why it why not so great back then. Amazing what happens when you actually follow the instructions! FX's answer→ Glad it worked at last! You will see strong differences depending on the type of rosemary you use, some are much more fragrant than others. I make a chicken or dove dish with rosemary, red wine, garlic and tomato sauce. (Don't judge, please) it is called Putacia (phonetic). 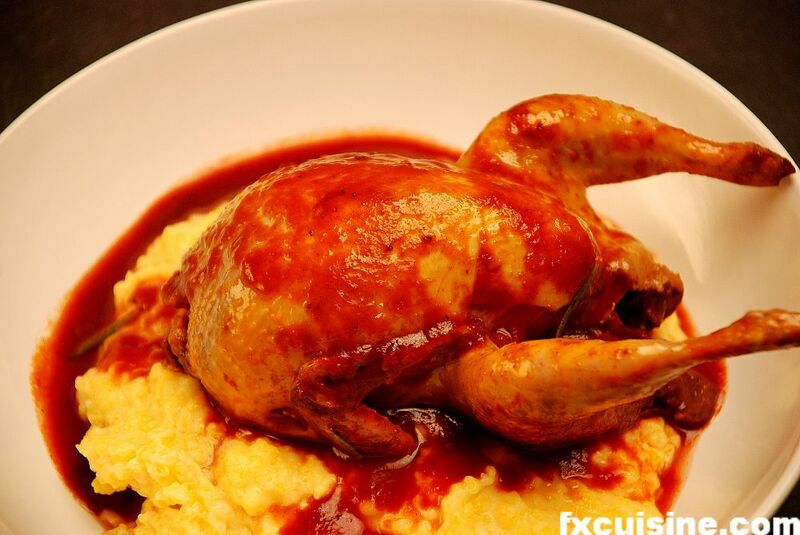 Do you know of this, my grandmother came from Ancona, Italy and this is her recipe. FX's answer→ Sandra would you have more information, I could not find any recipes under that spelling, just a bread called 'puccia' that is like a french fouée. I see no mention of what to do with the dried chili! I would assume you add it to the pan at some point? What would be a good substitute for a dried chili? FX's answer→ In the tomato it goes, substitute with chili powder.